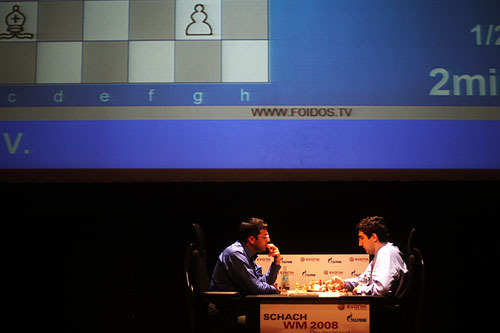 10.15.08 Exactly as in Game 1, both players made 32 moves in Game 2 before agreeing to a draw. The difference today was that Anand, typically a 1. e4 player, ventured 1. d4 in his first game with the white pieces. Could this be a harbinger of more Queen pawn games to come? 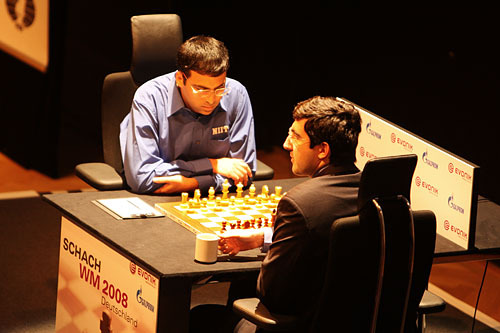 Anand eyes the board and prepares to surprise Kramnik with 1. d4 in Game 2 of the World Chess Championship. 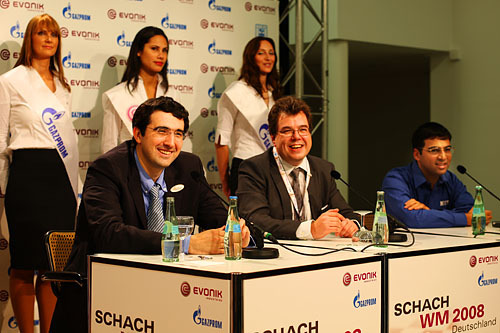 The match consists of twelve games, played under classical time controls: 120 minutes for the first 40 moves, 60 minutes for the next 20 moves and then 15 minutes for the rest of the game plus an additional 30 seconds per move starting from move 61. The moves of the game are projected on a huge screen behind the players. All are in good spirits at the post-game press conference.